Yesterday saw a major new edition to the UK Triathlon calendar, with the first edition of the Cardiff Triathlon (www.cardiff-tri.com) from Always Aim High Events. As well as a major new City centre location, the event also featured live streaming coverage on Tri247, thanks to the great work of Dream Team Television. 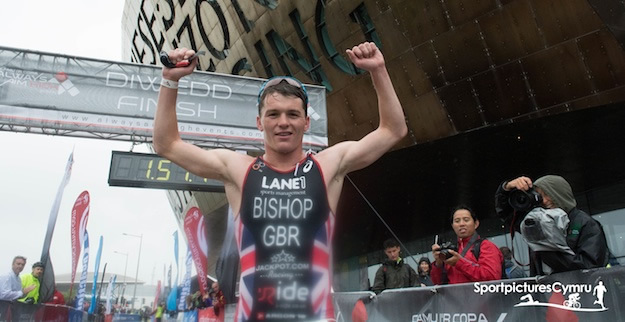 The headline winners were British Elite triathlete David Bishop - preparing for his first Senior Elite representation at the European Championships in two weeks - and Cardiff local Eloise Crowley. We also have separate post-race interviews with David and Eloise HERE. (You can still (re)watch the live coverage stream HERE). Cardiff Triathlon report -thousands flood into Cardiff for inaugural triathlon. On Sunday 28th June, Cardiff, the sports mad capital city of Wales hosted its first ever triathlon. 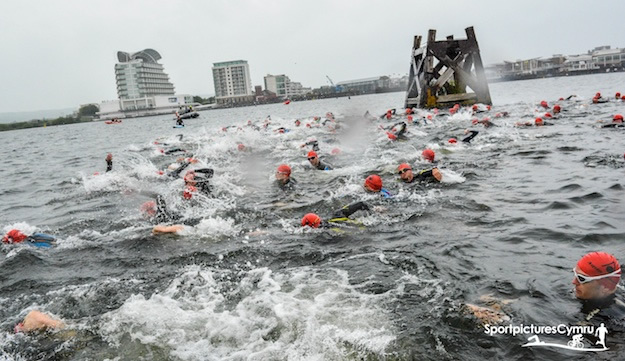 Over 1,200 triathletes swam the legendary waters of Cardiff Bay (for the first time ever! ), cycled beautiful closed roads around Cardiff and ran on a picturesque route out to the Cardiff Bay Barrage! All of which was broadcast live to an audience around the globe via the Tri247.com live stream. Over 4,000 spectators and local community members packed into Cardiff Bay to support the event. They were treated to loads of live entertainment; including climbing walls, bouncy castles and promising local bands and solo artists playing live music. After 1500m of swimming, 40km on the bike and a 10km run, it was GB triathlete David Bishop who emerged victorious as he blitzed his competitors with an incredible time of 1:50:44. Bishop beat Chris Silver who finished in second place and David Hynes, who finished third. Emerging out of the water and exiting T1 in first position, Bishop became the hot favourite to win the race. However, as the athletes returned into the Roald Dahl Plass following the challenging 40km bike leg, David Hynes had cut Bishop's lead to just 18 seconds. Not wanting to be beaten, Bishop put on the burners during the 10km run, recording an astonishing time of 31:11. This eventually saw him run out as the clear winner finishing two minutes ahead of his nearest challenger. In the female race it was Eloise Crowley who was first home with an unbelievable time of 2:07:52. This saw her crowned the first ever Cardiff Triathlon women's champion. Crowley loved the whole Cardiff Triathlon experience calling it “brilliant” and “very well organised”. The female race was a mirror image of the male race as local athlete Crowley led from start to finish. The Cardiff born athlete went on to win by 33 seconds ahead of nearest challenger, Caroline Higgins. The Cardiff Triathlon Sprint race saw Tomos Nesham and Hollie Elliott emerge as individual winners of the male and female races. Both stormed around the course in fantastic times of 58:26 and 1:05:39 respectively. Nesham, the 15-year-old from Pontypridd was ecstatic at the finish line and is certainly one to watch for the future. Halliwell proved just too strong for her competitors eventually finishing over 10 seconds ahead of her nearest challenger. “What a fantastic day! To be able to put on such a great triathlon in our capital city is a huge honour. Most, if not all of the major cities around the UK have a well renowned triathlon, and now Cardiff does too! It's incredible to see that the triathlon has attracted over 1,200 athletes in it’s first year, but we know it won’t stop there - this event will get bigger and better! It was brilliant to see so many supporters and people from the local community come out to support the event. We are a Welsh based event company and we are so happy to organise a race that the people of Cardiff and Wales can be proud of. We are very grateful to our partners at Visit Wales, Chain Reaction Cycles, Kinetica, Velindre, Cardiff City Council, Cardiff Millennium Centre, Pedal Cover, Aqua Sphere, Superfeet, Pentraeth Group, Future Inns, Amphibia, Kon-X, Jones o Gymru, Nevis Triathlon, Salomon, Morrisons, Tritopia, The Victoria Park Clinic and of course, Welsh Triathlon. If the 2015 race has got you inspired you can pre-register for the 2016 Cardiff Triathlon HERE. 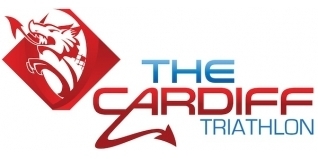 All other information about the Cardiff Triathlon can be found HERE.